Last November, while most people were sitting around the table with friends and family digging into a Thanksgiving turkey, I was putting my bags down for the first time in three days in a little bungalow overlooking Knysna Lagoon on South Africa’s southern shore. 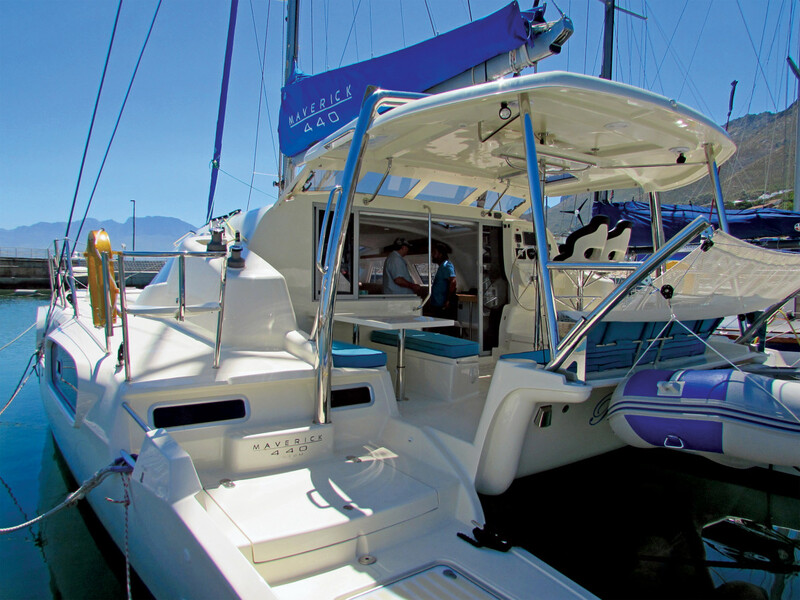 I had arrived in South Africa for a weeklong tour of the region’s boatbuilding scene, which boasts a seemingly endless amount of multihull builders, each with their own niche in the market. My trip had been organized (to great detail) by Kareemah Jacobs of the South African Boatbuilders Export Council (SABBEX) and would start with an overnight in Knysna, a couple days in St. Francis Bay, and wrap up with a few days in Cape Town. Eight boat builders in three cities in six days—this was going to be good. 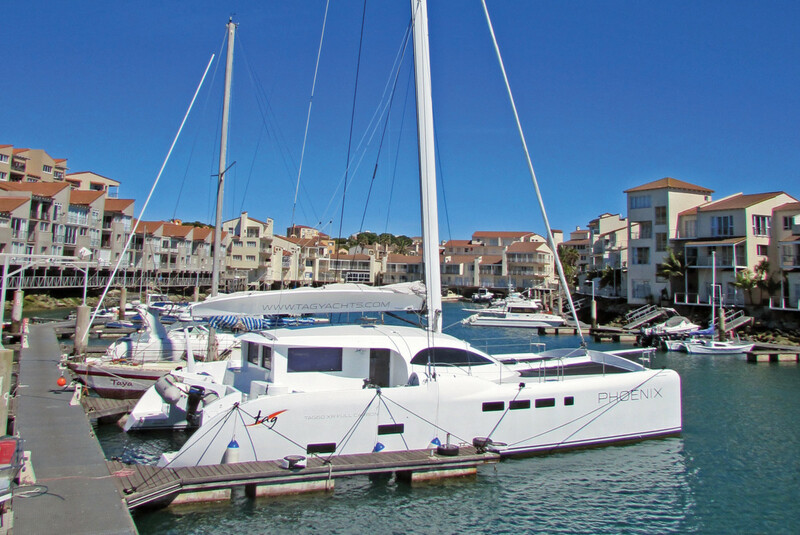 First up on the tour list was Knysna’s own Knysna Yacht Company. Company founder and CEO Kevin Fouche picked me up the morning after my arrival, and we headed to the factory, a quick jaunt up the hill from the harbor. 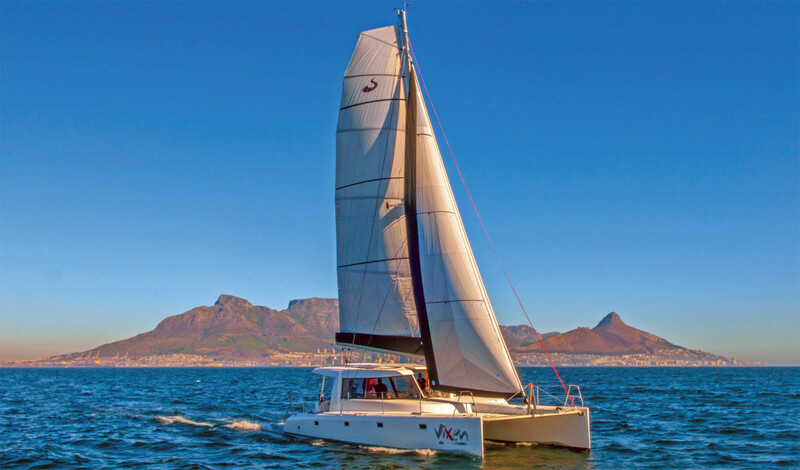 Knysna Yacht is a boutique builder that cranks out about four Knysna 500 SEs each year. Fouche founded the company in 2002, initially offering a 400 model, which grew to a 480. Currently, they offer the 500 and 500 SE. 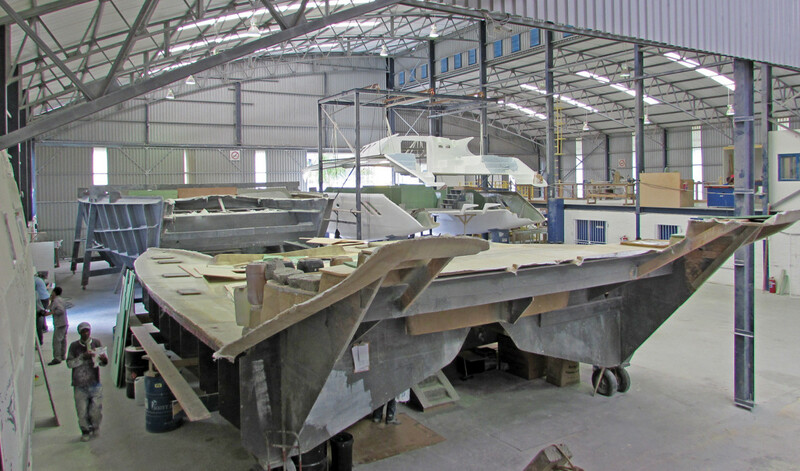 Like many of the builders in South Africa, Knysna builds semi-custom boats—they make sure that the vessel is constructed to be a sound cruiser and everything that goes in between those bulkheads is, for the most part, up to the customer. Knysna likes to fly customers out to the factory for a tour and to work with Kevin and the design team on the details of the build. The boats take about 11 months from start to finish. After touring the factory, we headed to the marina and jumped onboard a Knysna 500 SE for a little sail around the lagoon and some lunch on the hook. The wind was a bit heavy for full sail, so we mainly motored our way out to the infamous Knysna Heads, a notorious area where the lagoon meets the ocean, the bottom of which is laden with lord knows how many boats that have come to grief trying to skirt the area’s often heavy seas. As we inched closer and closer to the mouth of the lagoon (I would call it an inlet, but it is not legally recognized as an inlet due to the fact that it is so dangerous) I dialed back on the throttle a bit as I watched the cliffs inch closer and closer and the water narrowed in front of me. “Hey Kevin,” I shouted down from the helm over the wind, “how far out do you want me to go?” We had determined that the seas were too rough for us to head out into the ocean, and the idea of introducing one of the 500 SE’s hulls to the nearing rocks didn’t really appeal to me. The boat handled superbly, spinning about easily despite the wind and the strong current, and we headed to the lee of the heads to drop the hook and eat lunch. The aft deck was spacious and easily accommodated the seven of us onboard as we enjoyed a light lunch. After we ate, we headed back to the marina with just the jib flying and enjoyed a nice clip of boatspeed with the wind at the back. When it came time to head back to the slip, again the boat handled like a dream, with excellent close-quarters maneuvering. After our sail I hopped back to the hotel, grabbed my backpack, jumped in a car and headed east to St. Francis Bay. The next morning, I was greeted by Dylan Stephens and Ryan Osborne from Tag yachts, and we headed down to St. Francis harbor to tour the Tag 60, an impressive vessel by any account. Tag builds performance-based cruisers that don’t leave one wanting for creature comforts. The 60 that we toured will reportedly cruise comfortably around 24 to 25 knots and carries 1,658ft2 of mainsail on a rotating carbon wing mast. 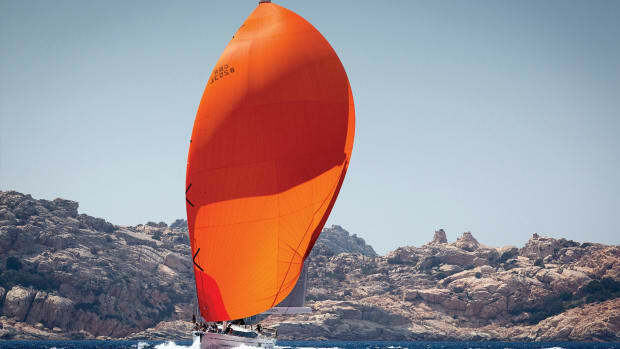 In the interest of keeping weight down, the 60 features a full carbon super-structure, and for ease of handling the boat features hydraulic controls for all of the sails and lines. And while right now you’ll only see Tag 60s cruising about, there are big things coming from this builder. When I toured the facility Tag was underway on building its new 50-footer, which launched this past January, with two more hulls currently underway. 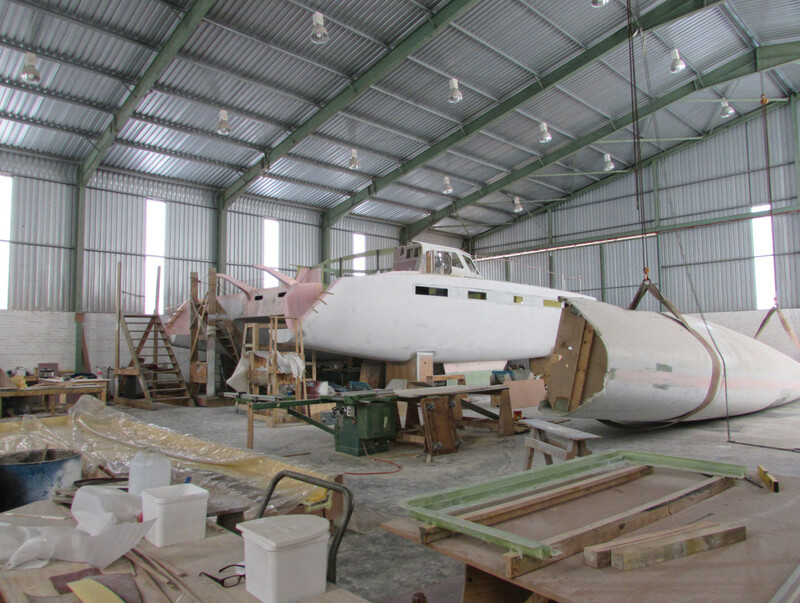 In addition, they’re building a 60MK2, which will be an open-cockpit version of their current 60-footer. The bigger news will come from the company when their new facility in the nearby city of Port Elizabeth is completed. Due to the physical constrictions of St. Francis Bay harbor, the largest boat the company can currently launch is a 60-footer. Once it moves to Port Elizabeth, the company has plans for a 72ft day-cat. The company is looking up and down, with plans for a new line that will be in the 80ft to 100ft range as well as a smaller model that will be in the 40ft to 45ft range. Keep your eye on Tag, they’ve got some interesting stuff coming down the line. After Tag, I made my way down the road (literally) to St. Francis Marine and met with one of the elder statesmen of the South African boatbuilding scene—Duncan Lethbridge. 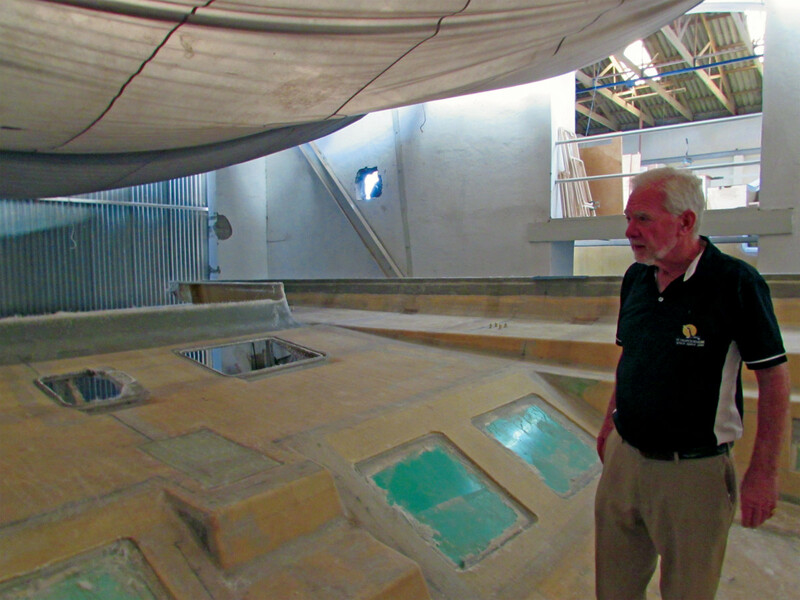 Duncan has been pumping boats out of his facility for nearly 30 years, first building a 44-footer, then a 48, and now building the St. Francis 50. 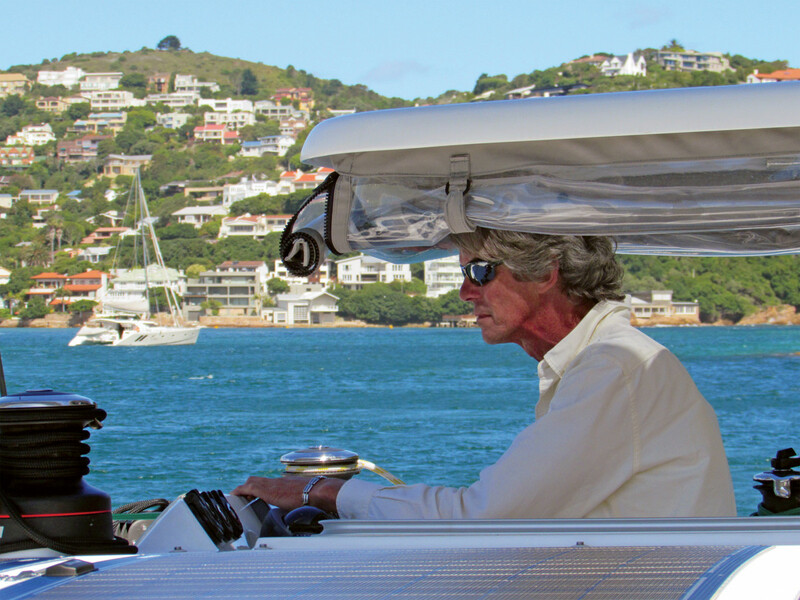 Duncan’s story of how St. Francis Marine began is actually a fairly common one in the South African boatbuilding scene—he wanted to take the family cruising so he built a boat for himself and took it around to the local yacht clubs before setting sail. People would ask him about the boat and if he could build them one, and eventually, St. Francis Marine was born. This is a common thread throughout the South African boatbuilding industry—most of the company owners that I met seemed to get into the game almost by accident. It started with a boat for themselves to go cruising on, and it turned into a company. Currently, hull number 20 of the St. Francis 50 is in build. Hull number 19 just went to the American science fiction writer Hugh Howey. He was very hands-on in the build process, and many of the custom options that he worked into the design Duncan liked so much he is incorporating them as standard features going forward in the new St. Francis 50 MK2. Duncan can build approximately three boats a year, with 99-percent of the boats going into the U.S. market. 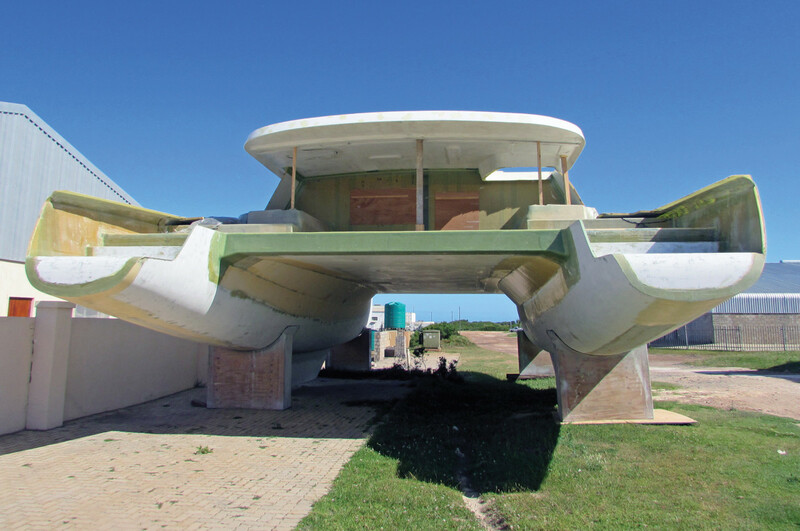 Duncan is a textbook example of the interconnectedness of the South African boatbuilding scene—the molds for St. Francis’s 44-footer went to Kevin Fouche when he wanted to start his company in 2002. Duncan moved up to the St. Francis 48, and Kevin took the molds for the 44 and started Knysna Yacht Company. 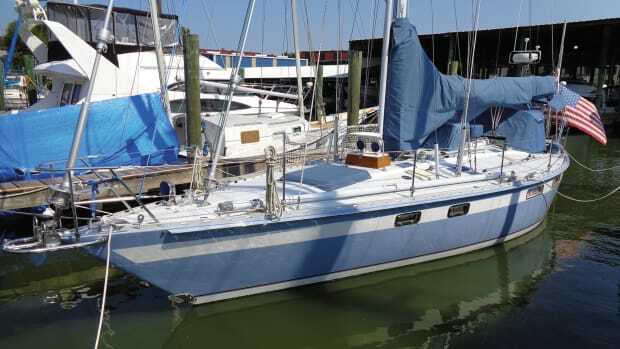 This was just the first example of something that I would come to find again and again as I met with the key players in the South African boating community. It is just that—a community. Everyone knows each other, and they help each other out. When it comes to importing parts for the boats, builders will group orders so they can get a better deal. 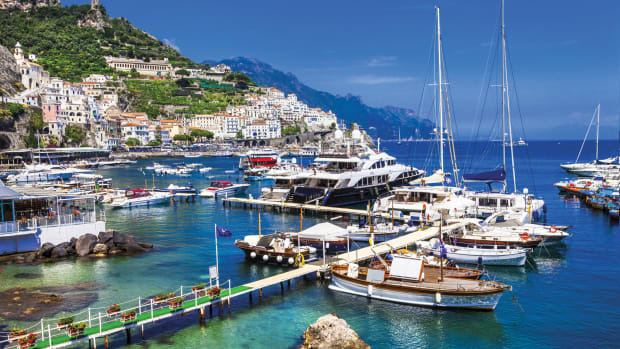 And while yes, they are all technically competing with one another within the multihull world, they each seem to have carved out their own little niche within the field and have found a way to live comfortably with one another. 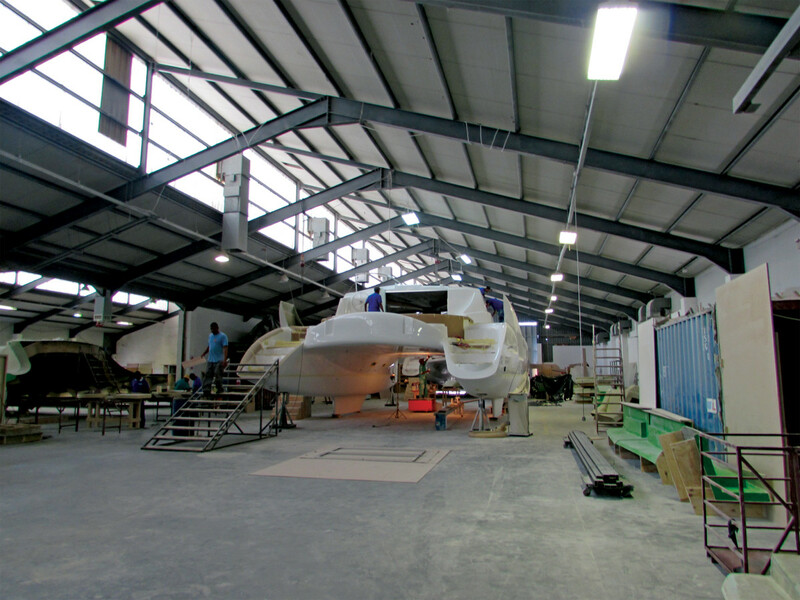 After a pleasant tour of the waterways of St. Francis Bay courtesy of Duncan, we headed to Nexus Yachts, which is now the yard building the Balance line of catamarans. When I was there, construction of hull #2 of the Balance 526 was under way. 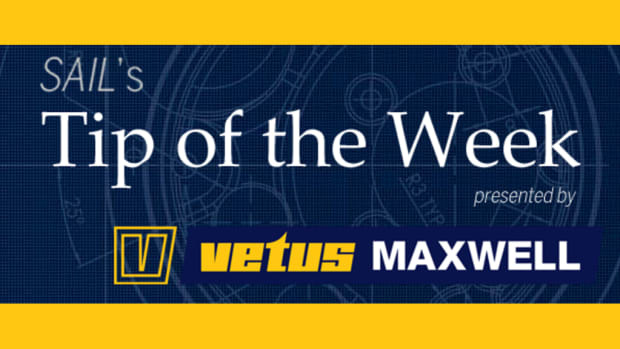 Nexus was founded by the Paarman brothers Mark, Roger and Jonathan, and John Henrick, along with naval architect Anthony Key, who drew the design for their first expeditionary catamaran—the Nexus 600. The first Nexus 600 (now the Balance 601) was launched in 2009, with two more shortly following. 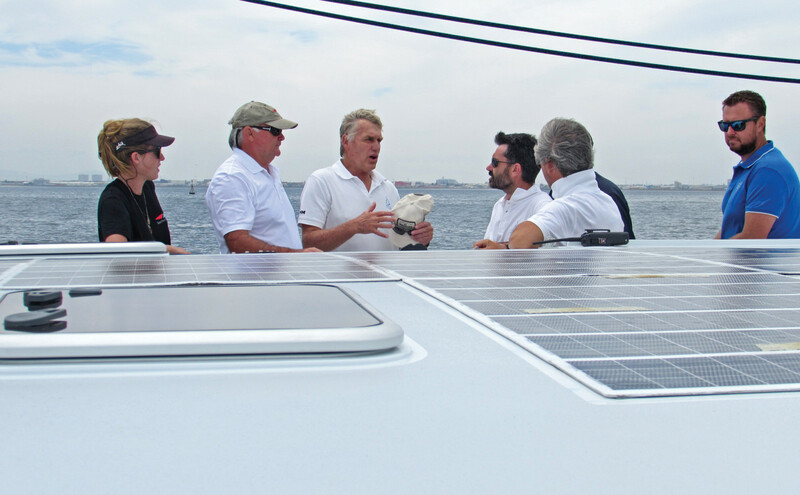 Phillip Berman, president of the Multihull Company and one of the driving forces behind Balance Catamarans, learned about the Nexus 600 project and liked what he saw. 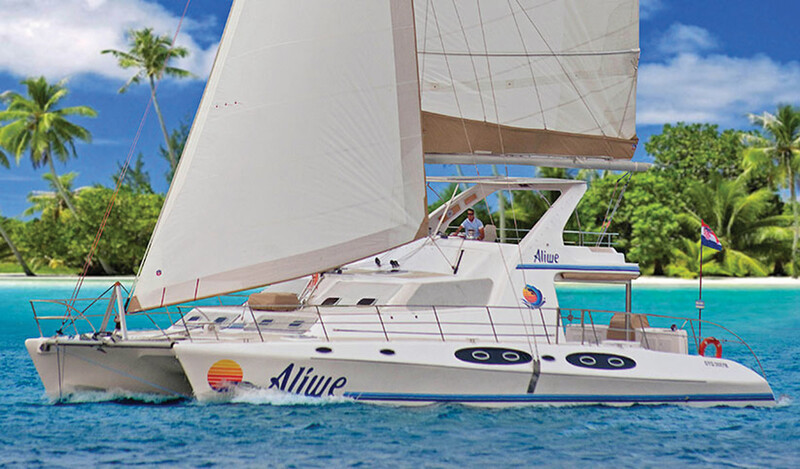 After meeting up with the Nexus founders at the Annapolis Boat Show in 2010, Balance catamarans formally came about in 2012, with the decision to rebrand the existing Nexus models under the Balance umbrella and produce the new Balance 526. After a lovely evening and a South African Braai (pronounced “Bry,” it is a South African barbecue, and it is delicious) with the folks from the Nexus yard, I woke the next morning and it was off to the airport and over to Cape Town to continue the tour. I hadn’t even checked into my hotel when I met with Fiona and Peter Wehrley of Matrix Yachts at the Royal Cape Yacht Club. I tossed my bags in the back of the car, and we headed out to the factory. The next morning started bright and early as Rudi Pretorius, founder and CEO of Maverick Yachts, picked me up at my hotel and we made our way out to the factory. Maverick builds a 40-footer and a 44-footer, same hull, the only difference being the swim platform and boarding area. They produce about four boats a year in what used to be the Gunboat facility when that company was doing its thing in South Africa. (Rudi even employs several workers who worked for Gunboat when they were here). 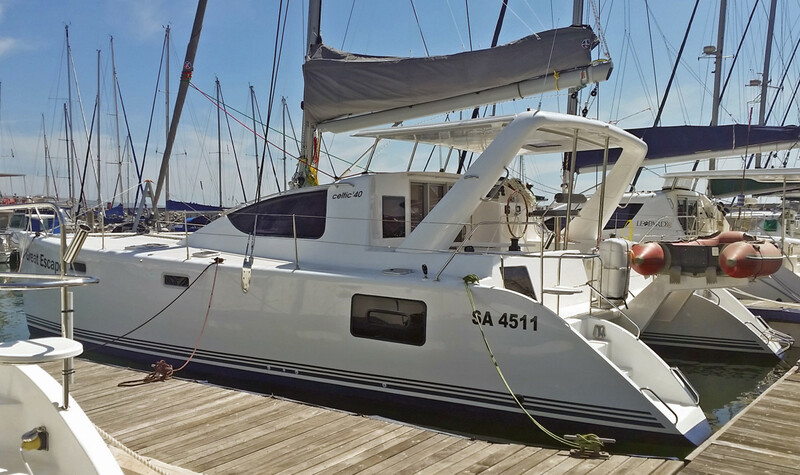 Thinking I had already seen plenty of raw fiberglass and dusty shop floors—truth be told, I had—after a quick spin around the factory we jumped back into the car and headed out to Gordon’s Bay and hopped onboard a Maverick 44 for a sail. A lovely cruise around False Bay gave me a good feel for the boat and South African sailing in general. 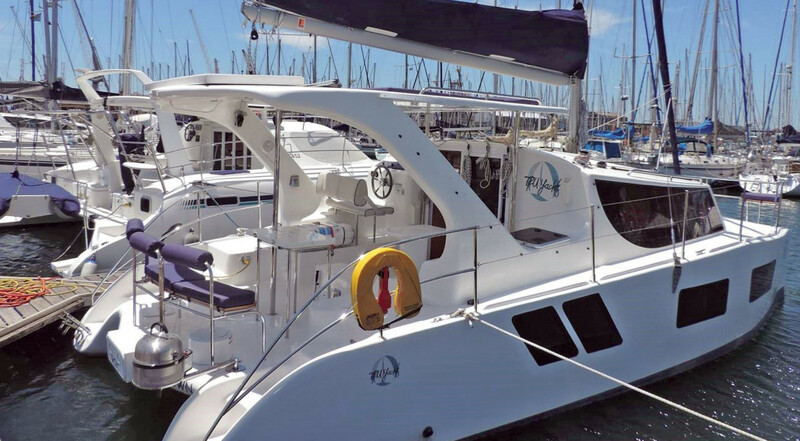 The trick for building boats for sailing in South Africa is that you not only have to have a seaworthy boat that can handle the often rough waters of the South Atlantic and the Indian Ocean, you also have to make sure that the boat is livable and can keep cruisers comfortable for the time between destinations. “When people sail, they typical want to sail from point A to point B,” Rudi told me. “The thing is, there aren’t many point B’s around here.” That leads designers to build boats that are as much fun underway as they are homey when you’re on the hook. It is a delicate balancing act, but one that is well accomplished by boats coming out of South Africa. After meeting with Rudi I went back to my hotel and enjoyed some sightseeing as I wandered the streets of Cape Town. It might sound obvious, but for those who haven’t been, Cape Town is a fascinating, beautiful place. 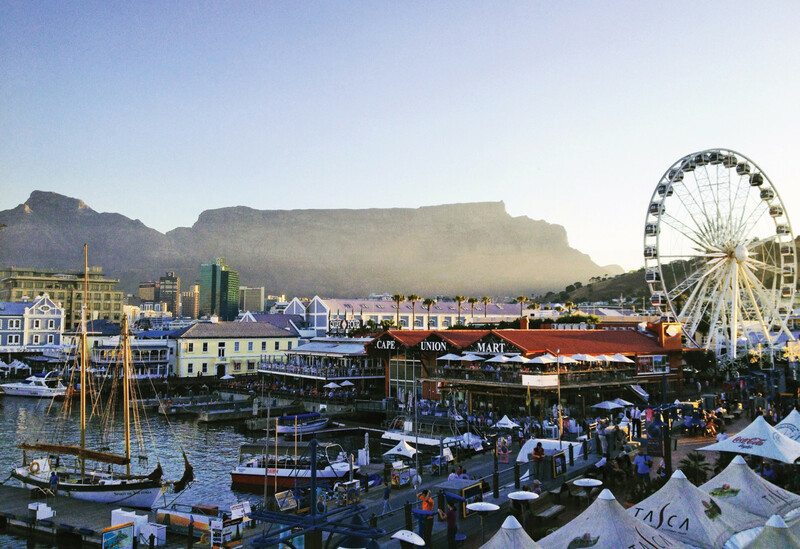 It is a metropolitan city framed by Table Mountain to one side (which was added to the new wonders of the world list in 2012) and the harbor to the other, offering a wide array of food and drink, places to shop and things to see. For anyone who hasn’t been, I would highly recommend it. Next on my hit list was a meeting with Mark Delany of Two Oceans Marine. Two Oceans builds two fully custom boats a year with a focus on the 60ft to 80ft market. 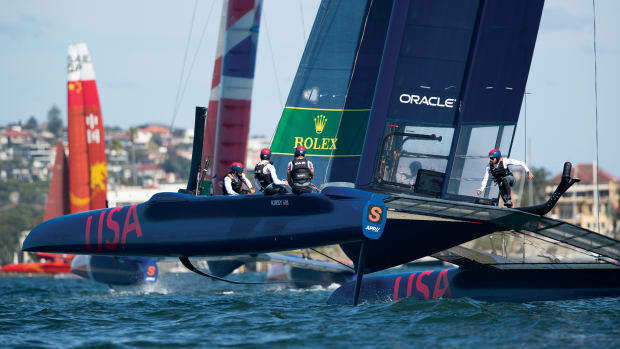 When I was there they had three builds underway, a 72ft and 60ft sailboat, and a fully-carbon 60ft high-performance cat. 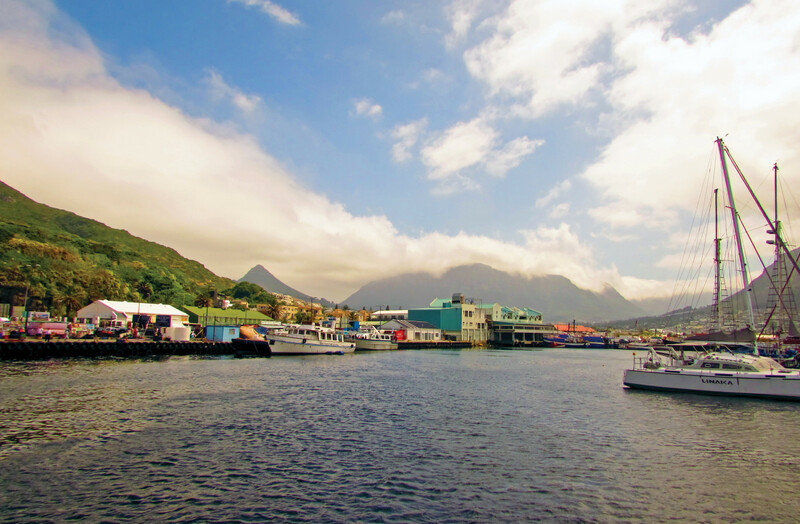 The company stays pretty busy; in addition to the sailboats it builds, it’s one of the region’s main producers of large power catamarans, commercial and recreational fishing boats, passenger ferries and just about anything else that floats. After touring around the shop with Mark, it was back in the car and over the mountains to Camps Bay on the back side of Table Mountain, where Mark keeps the boats after they splash. We toured a brand-new 75-footer that had just splashed, and man was it impressive. 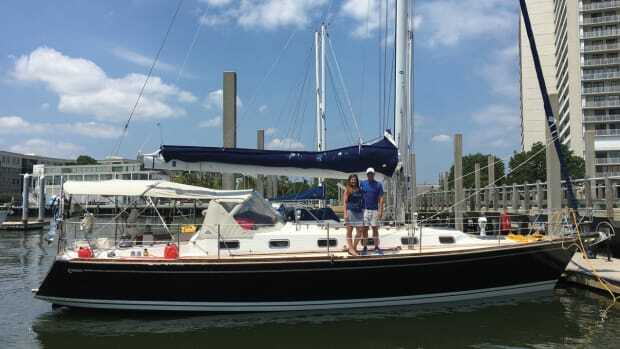 As one would expect from boats in the rarified 70ft and over custom market, the fit and finish were top-notch. And again, as South African boats tend to be, the Open Ocean 750 is not just another pretty face; one of Mark’s boats completed the last Cape to Rio Yacht Race in just a hair over 28 days—not too shabby. For my final meeting of the day, I was shuttled out to the Phoenix Marine yard, where the company is now building the Xquisite line of catamarans. 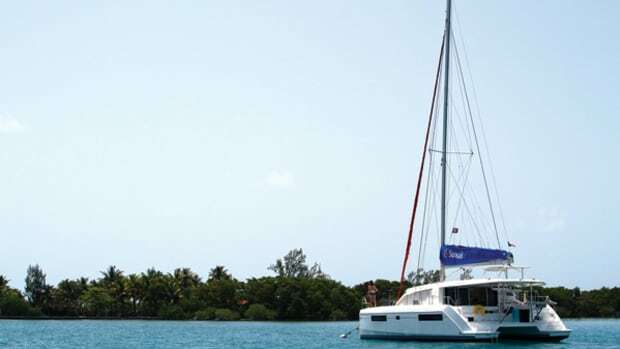 The Xquisite line of catamarans grew from the defunct Dean Catamarans, which produced over 100 40-footers and 70 44-footers, and had finished building the molds for a 50-footer before going out of business in 2012. From those molds came the basis for the Xquisite X5 (like a phoenix rising from the ashes, hence the company name). 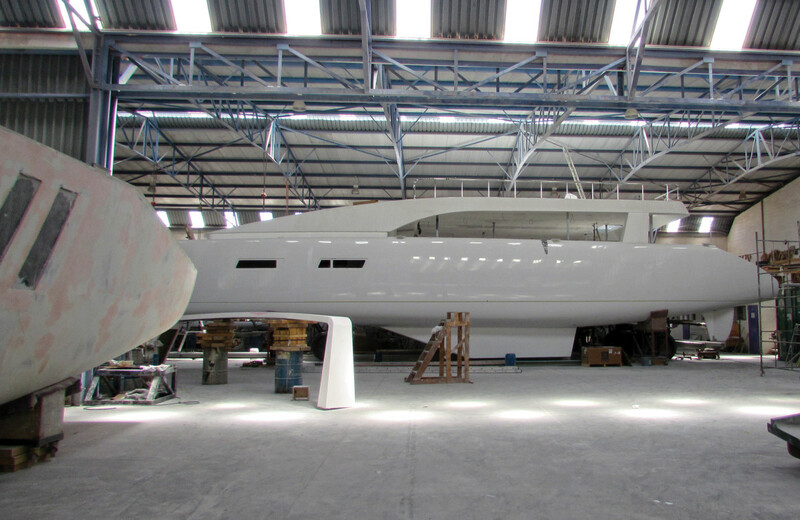 I met with Rudolf Jonker, chief designer on the X5 line, Colin Etheridge, the company’s general manager (who, as the former GM of Robertson & Caine, knows a thing or two about managing multihull companies) and Clinton Jones, for a tour of the factory. During my visit, the first Xquisite X5 was nearing the end of construction, and when finished I’m sure it will be a very cool boat with a lot of unique features. A good sign for the company—it will soon be moving to a new facility a little bit down the road from its current location that will allow it to build approximately 10 boats a year, five sail and five power. My last full day in South Africa started out with a trip down to the waterfront to meet hull #1 of the new Balance 526, which had splashed just a week prior and she made her U.S. debut earlier this year at the Miami International Boat Show. 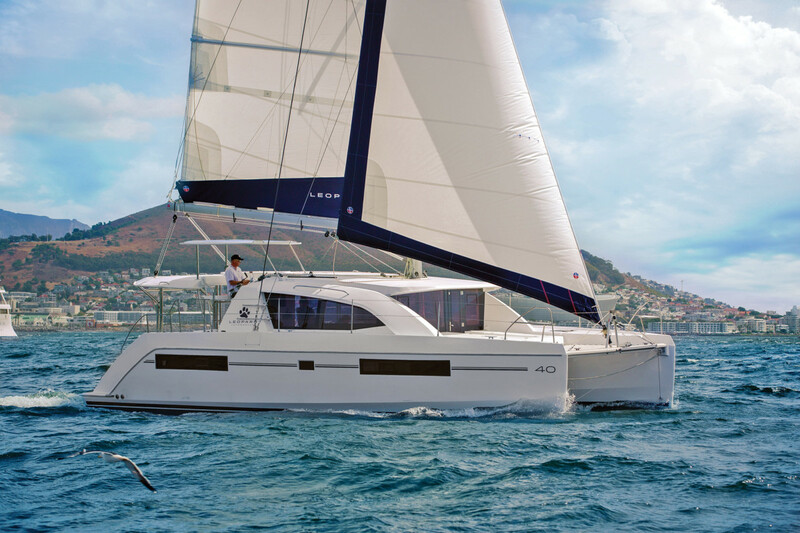 The 526 is a beautiful boat with many thoughtful touches, from an option in-boom furling mainsail system to an interestingly designed helm that features a molded-in seat and moveable wheel that allows the skipper to steer from the shelter of the hard targa over the cockpit or a high perch in the open air. 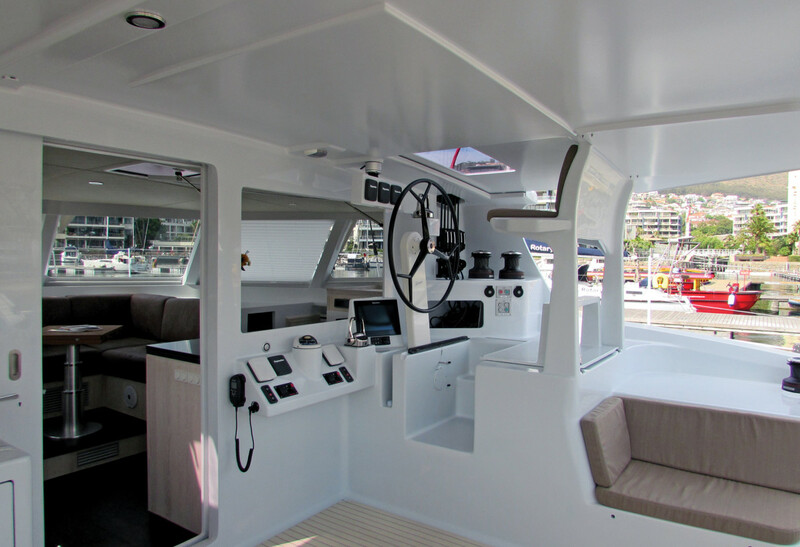 The boat features Jefa steering and a sophisticated electrical system. The rig is carbon fiber, and there is carbon reinforcement on all of the heavily loaded sections, weight savings that lend to the boat’s 10-ton displacement, and the hulls are cored beneath the waterline with a Corecell foam core. 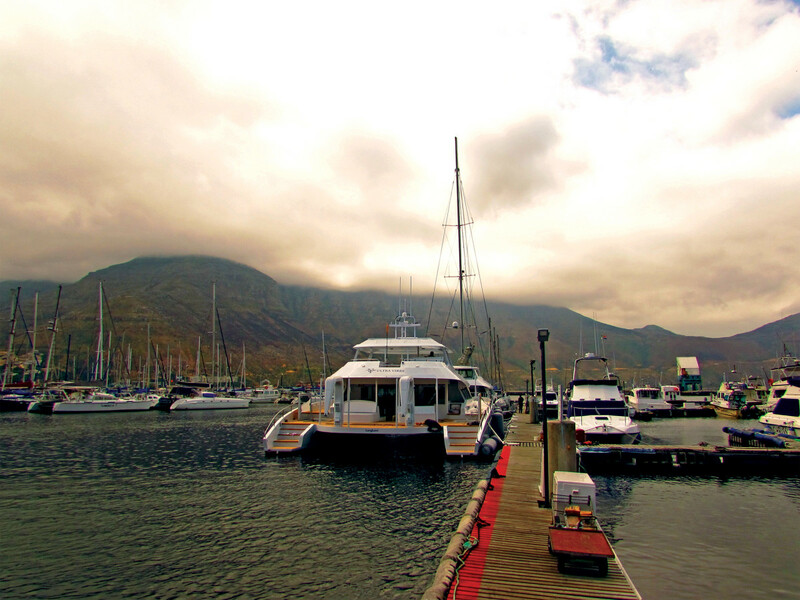 As we headed back to the marina, with the clouds pouring over Table Mountain, towering high above Cape Town, I reflected on my time in South Africa, the folks I had met and the boats I had seen. I think one would be hard pressed to find a place where there are so many different, boutique multihull builders, all playing happily in the same sandbox, all seemingly somehow intertwined.  It is a boatbuilding community like none I have ever seen, and I think that this relationship between the different boatbuilders and their boats is beneficial to us all. The resulting products speak for themselves—a variety of different boats, all built to high standards and all designed to sail well in their rough native waters. And with many builders expanding, and most every build list full, I expect to see big things coming from these same South African boatbuilders for years to come. Hopefully something newsworthy, something that requires me to go back. While I managed to meet with several of South Africa’s boatbuilders, the amount of time I had in-country simply didn’t allow me to visit with them all. Here are some of the other builders in the region.